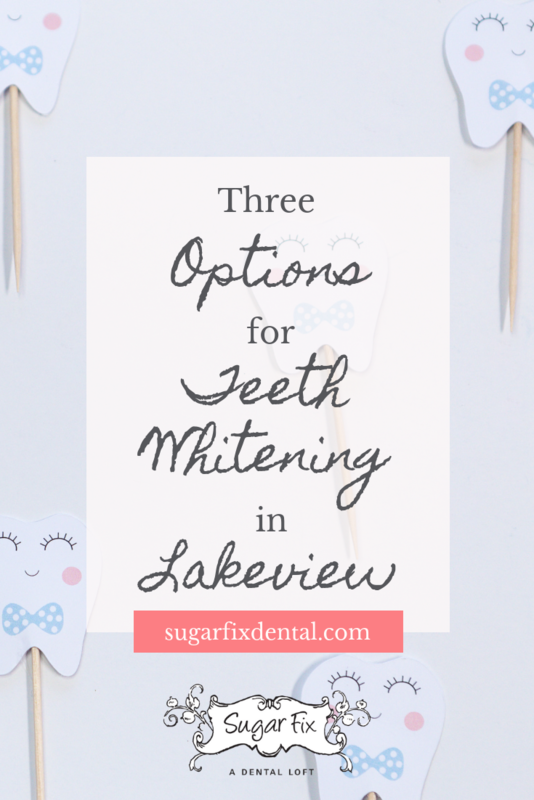 Three Great Options for Teeth Whitening in Lakeview! We might be a little biased, but we honestly think Sugar Fix Dental Loft is THE place to go for teeth whitening in Lakeview! Why? We have several different teeth whitening options for our patients depending on what you are looking for! Unlike over-the-counter products, which come with poorly fitting trays and result in marginal improvement, professional whitening offers dramatic results in a single office visit. If you are looking to create a whiter smile fast, Zoom® is a great solution! At the beginning of your appointment, we’ll isolate your teeth from the gum tissue to prevent discomfort and irritation from contact with the whitening gel. Next, we’ll carefully apply the will apply the Zoom® whitening gel over your teeth. We will activate the gel with a special light that is directed at your teeth for a more rapid absorption of the gel. After 15 minutes, we’ll remove the gel and light from your teeth. This process will be repeated two more times. The entire process takes an hour or less, and patients are free to leave as soon as the third session is over! KöR is another great whitening option! It is not quite as quick as Zoom® but it combines an in-office treatment with an at-home maintenance program for amazing results. The KöR Whitening Deep Bleaching™ System works by restoring your teeth’s ability to absorb oxygen. The oxygen from its whitening gel is absorbed deeply into the tooth, dissolving stain molecules. The combination of at home and in-office treatments are completed over a two-week time span. Sometimes, patients are a bit wary of in-office procedures and prefer an at-home whitening kit. Rather than completing the whitening in one session, at home options utilize a lower concentration of hydrogen peroxide that is spread out over multiple sessions. This means it isn’t quite as effective as an in-office treatment, but it is a good option for those with sensitive teeth. If you have deep stains that may not improve with a traditional whitening treatment, dental bonding and porcelain veneers are a great alternative option. They can conceal stains and give you a complete smile makeover in very little time! After receiving a whitening treatment, it’s important to avoid all staining foods or drinks for 48 hours. If you are a heavy coffee or red wine drinker, we would recommend scheduling whitening treatments more often. We can help you determine an appropriate timeline to keep your smile sparkly and white. Ready to move forward? Give us a call today to talk about which whitening option would be best for you! We would love to help you achieve a gorgeous, white smile! P.S. Stay Tuned for our Launch! White Haute Teeth Whitening Bar will be launching in a few weeks in Sugar Fix’s second space, which means you’ll have another convenient option for teeth whitening in Lakeview! We will be offering quick, 15-minute flights of white, which means you can get a sparkling white smile in no time. Watch the blog here or stay tuned to the Instagram page for more details about when we will officially be opening the doors to the bar!